My husband and I really enjoy pizza, but my dad doesn't care for pizza much and really loves sweets. So we enjoyed delicious pizza, and I used some of the dough to make dessert for all 3 of us to enjoy. 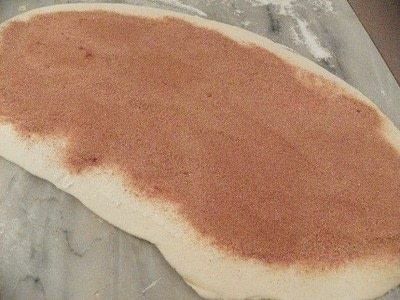 Roll out some pizza dough until it's nice and thin, the thinner it is the more flavor you will get, but also it will be more delicate. 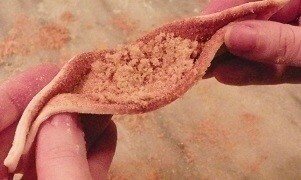 Once it's rolled out spinkle on the cinnamon sugar, and for some added flavor you can also add in some brown sugar. 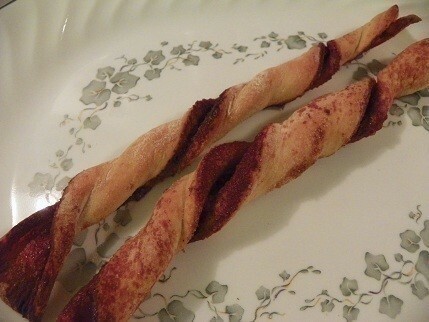 Cut the dough into strips, and twist them. By pinching the ends together and twisting quickly you can trap most of the cinnamon sugar inside with little spilling out. Twist the dough as much or as little as you like, and then place them on a greased baking sheet. Bake them for around 10 minutes at 450 F or until they have a nice golden brown color. Let them cool and then transfer them to a plate and enjoy! 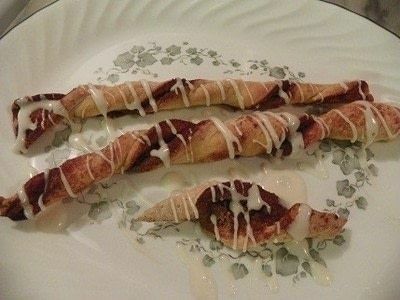 Or mix up some icing and drizzle that over top of them. nothing says love like making sweets for your husband and dad.